Lot 9171, Kampung Telok Gong, 42000 Port Klang, Selangor, Malaysia. Toptek Engineering Service Sdn. Bhd. 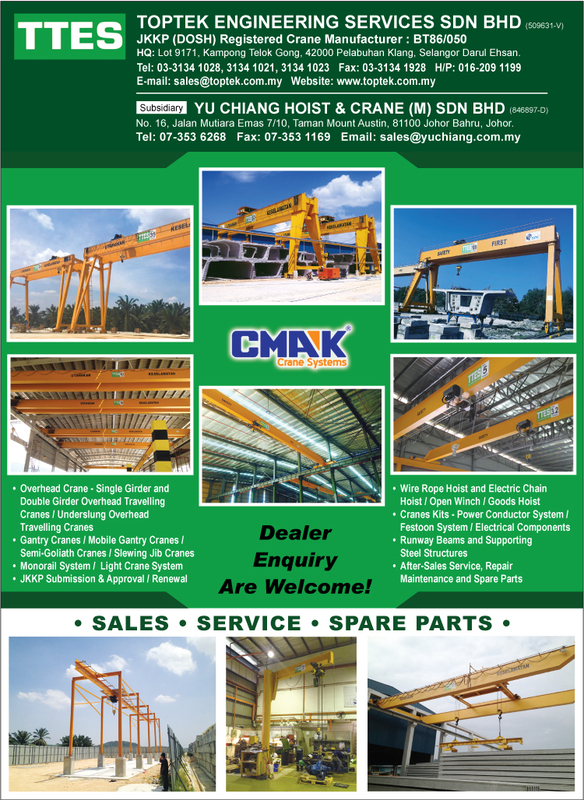 was established in 1995 as a steel structure for crane companies within the Klang Valley specializing in overhead traveling cranes and goods lift fabrication. Through deep commitments towards good quality products and customer satisfaction, Toptek Engineering Service quickly became one of the leading materials handling related fabrication company in West Malaysia with a branch office Johor Bahru.We have structured our organization to serve the rapid changing face of today’s industries with personnel specializing in their respective areas such as design, manufacturing, sales and service of material handling system. In 2007,Yu Chiang Machinery (Kunshan) Co. Ltd., Taiwan an ISO 9001 certified company with over 30 years’ experience in crane equipment manufacturing , awarded the rights to Toptek Engineering Service Sdn. Bhd. to be their Sole Distributors for Malaysia and Singapore for the Distribution and sales of their products such as electric wire rope hoist, electric chain hoist and other crane related products. Toptek Engineering Service Sdn. Bhd. policy is to achieve sustain, profitable growth by providing services, which consistently satisfy the needs and expectation of it, customers. This level of quality is achieved through adoption of a system of procedures that reflect the completence of the company to existing customers, potential customers and independent auditing authorities. Achievement of this policy involves all staff, which is individually responsible for the quality of their work, resulting in a continually improving working environment for all. This policy is provided and explained to each employee by the Quality Executive or Manager. • To endeavor, at all times, to maximize customer satisfaction with the services provided by Toptek Engineering Service Sdn. Bhd.